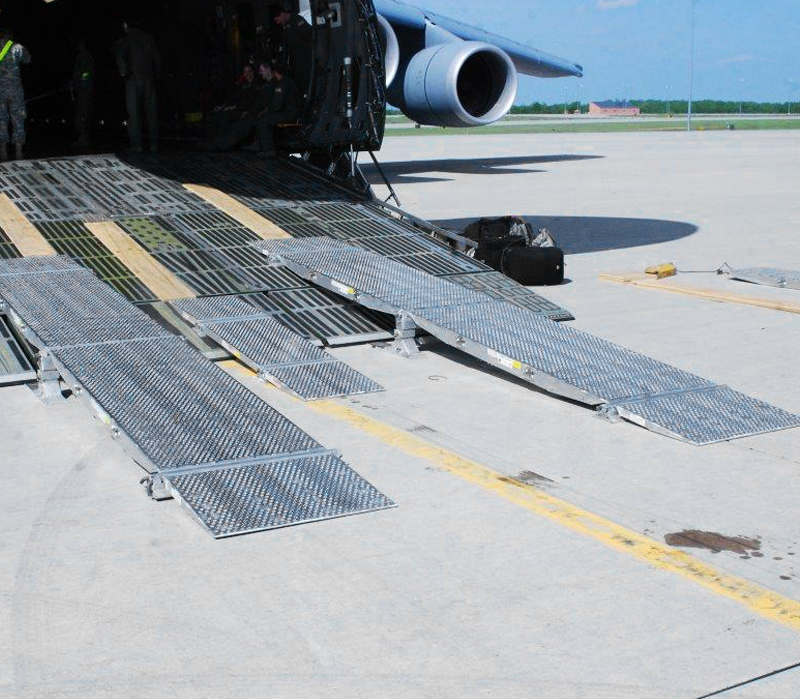 Heavy Duty Ramps offers the only aluminum approach shoring system currently certified by the U.S. Air force for use on their transport aircraft. The DOMOPS Airlift Modular Approach Shoring (DAMAS) and Helicopter Modular Approach Shoring (HeLMAS) systems are revolutionizing the way rolling stock can be deployed. 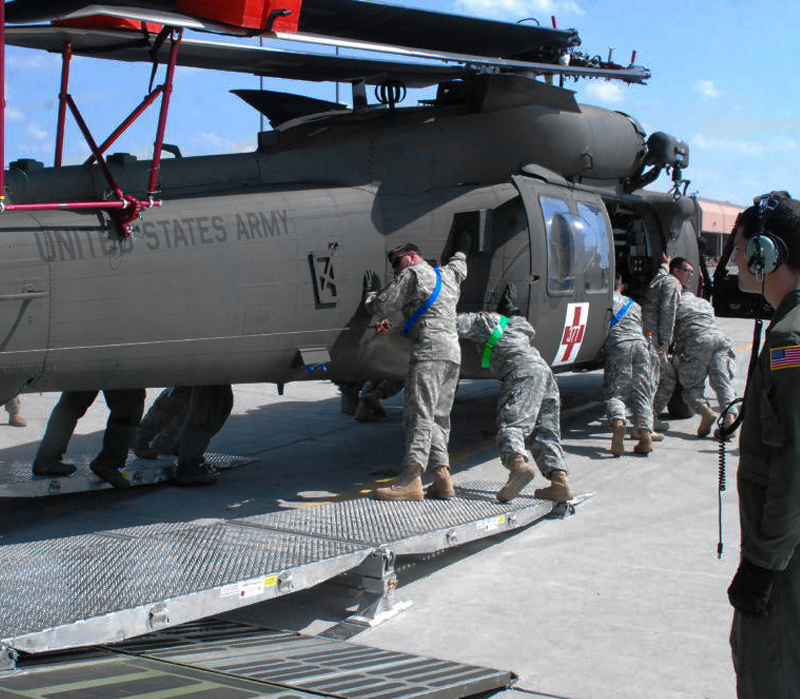 The DAMAS and HeLMAS systems allow equipment previously thought impossible or impractical to be airlifted, to be loaded quickly and safely into a cargo aircraft. 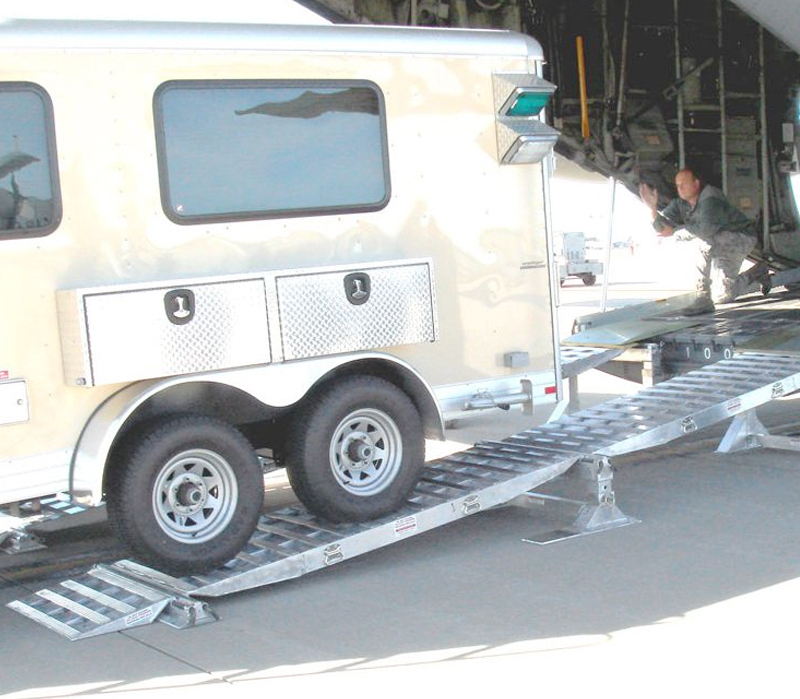 The DAMAS/HeLMAS modular design allows C-130, C-5, and C-17 Loadmasters to solve the loading challenges of vehicles or trailers with low ground clearance, long overhangs, long wheelbases, or items with a long projection (too tall with a long overhang). The DAMAS/HeLMAS system can be configured to rest on the aircraft cargo ramp or below the aircraft cargo ramp, depending on the specific requirements of the project. The DAMAS/HeLMAS is designed to be set up and taken down in minutes. The components are designed to eliminate the use of cumbersome, heavy wood shoring, and to reduce the elapsed time to set up a loading system. Use of the DAMAS/HeLMAS system can reduce loading times by as much as 70%. The DAMAS/HeLMAS system has also been designed to be easily stored in the plane, in one of the prime movers (in the back of pickup with an 8′ bed), or in the Warrior Shipping Containers, which are also manufactured by Heavy Duty. The all-aluminum construction of the DAMAS/HeLMAS system will eliminate any concerns from U.S. Customs or Agriculture related to boring insects when returning from an overseas deployment, since no wood is used in any part of these systems. The DAMAS/HeLMAS components are modular, designed to be interchangeable, and can be assembled in a myriad of different configurations. The DAMAS system is constructed using rungs for normal tires, while the HeLMAS system is made using a punched traction plate design for smaller tires such as on helicopters and dollies. The DAMAS/HeLMAS systems are similar to an erector set. Several different factors figure in to how big, or how small the erector set needs to be. Consider the wheelbase of the equipment being loaded – the distance from the center of front tire to the center of the back tire. Ground clearance, or low hanging fruit such as drop receivers, pintle hitch, trailer jacks etc. also needs to be evaluated. Also consider the length of the trailer with a prime mover, and the length from the rear axle of the trailer, to the back of the trailer. Any system can be added to or subtracted from, depending on the specific loading application. All Q numbers are interchangeable with ramp stands, and ramp pads. 30” and 36” wide ramps can be used with any ramp stand, or ramp pad. We will also custom build a system to meet your unique specifications! There are two ways the DAMAS/HeLMAS systems can be used. They can be used as a layover ramp that rests on the aircraft cargo ramp or on ramp toes (most commonly used application). To protect the aircraft door in a layover system, we bond a rubber pad to the underside of the top ramps or wedges that lay on the aircrafts door. 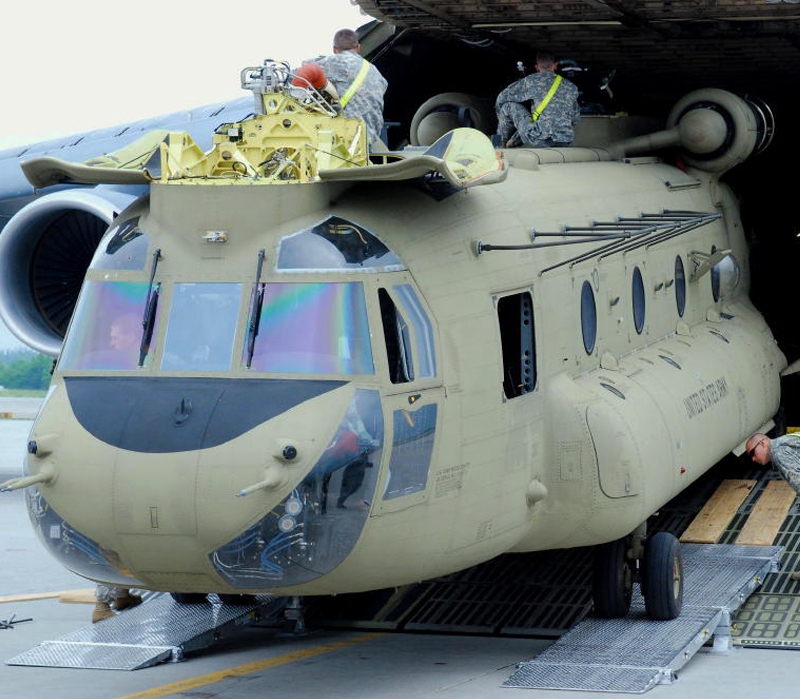 The DAMAS/HeLMAS can also be used as an extension of the C-130 cargo ramp, utilizing “truck loading ramps”. 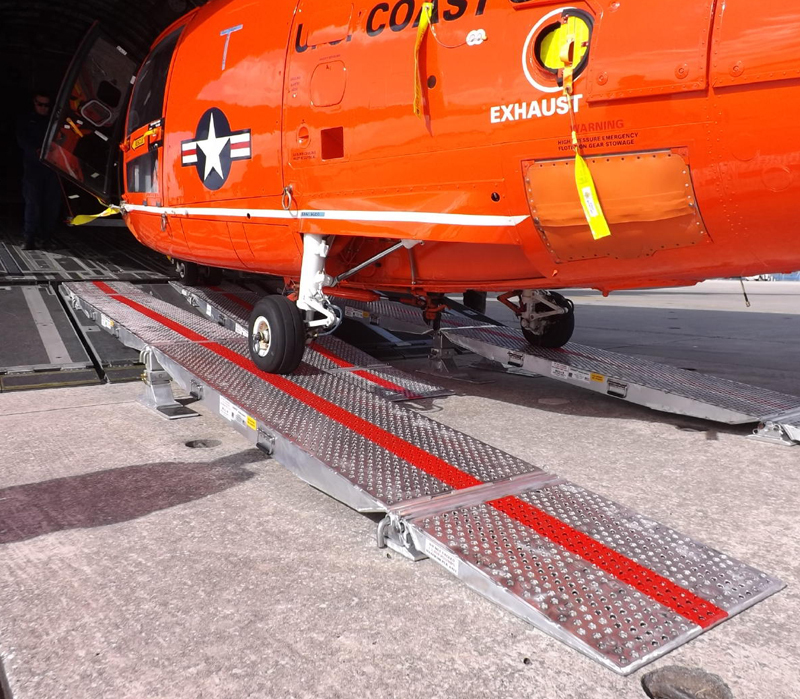 In this configuration the DAMAS/HeLMAS system is placed under the C-130 cargo ramp/truck loading ramps. This is used to decrease the angle at the C-130 ramp crest solving the “projection” problems.